For a long time – longer than he even cares to remember – Mike Hopkins was certain about his coaching future. He would someday succeed his boss and mentor, Jim Boeheim, as the men’s basketball coach at Syracuse. He was comfortable with that notion, if only because Syracuse was all he knew. He had played there, gone overseas to play for three years after graduation and then returned as an assistant for 22 years beginning in 1995. The counting ended last March when Hopkins took the job as the head coach at Washington, 2,740 miles and a lifetime away from Syracuse. So far, the trip west has worked out just fine. After beating Arizona State on Feb. 1, the Huskies stunned then-No. 9 Arizona two days later. Suddenly, long-dormant Washington – 17-7 overall, including a win at Kansas, and 7-4 in the Pacific-12 Conference – is on the NCAA Tournament bubble. Hopkins’ decision to finally leave Central New York came after he had an epiphany about his coaching future that was inspired by watching his peers succeed. Like Hopkins, who just turned 47, Collins and Wojciechowski had been assistants under their college coach, Mike Krzyzewski. Like Hopkins, both stayed longer than expected. And, like Hopkins, both knew their boss wasn’t quitting anytime soon. Both had worked with Team USA, just as Hopkins had done because Boeheim was Krzyzewski’s top assistant. And so, when Washington athletic director Jennifer Cohen asked him to come to Seattle to talk about the job, Hopkins was willing to listen. The school had fired longtime coach Lorenzo Romar after going 9-22 and failing to reach the NCAA Tournament for the sixth straight season. Washington’s basketball history isn’t exactly littered with success. The school last made it past the Sweet 16 in 1953, which was its only appearance in the Final Four. Hopkins knew the chance to build something unique was there. And he knew it was time to stop waiting for Boeheim. Chances were decent that Godot would show up before Boeheim, now 73 and in his 42nd season at the helm, retired. Hopkins grew up in sunny Southern California but was dying to spend winters in snowy Syracuse by the time he was in high school. Before Hopkins’ freshman season at Mater Dei High School his coach, Gary McKnight, took him to Syracuse’s basketball camp. He met Washington there, which was a thrill. He also got on Boeheim’s radar, though not necessarily as a priority recruit. By his junior year, Hopkins was starting some of the time and as a senior he averaged just less than 10 points a game, scoring 20 in his farewell game at the Carrier Dome. He also made a number of winning shots that cemented him in the memory of Syracuse fans – and Boeheim. Which is why, when Hopkins stopped playing, the head coach hired him right away. Twenty-two years later, after telling Cohen he would take the Washington job but didn’t want to tell anyone until Syracuse’s season was over, Hopkins had to give Boeheim the news that he was leaving. Washington has no seniors who get substantial playing time. 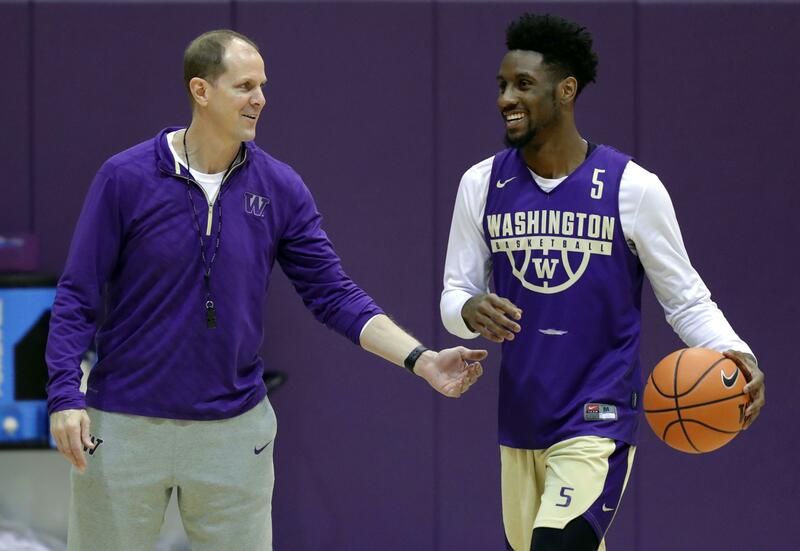 The Huskies’ best player is 6-foot-4 shooting guard Jaylen Nowell, a local kid from Seattle who decided to keep his commitment to the school even after Romar was fired. He’s averaging 16.2 points per game and should be back next year. Fans stormed the court Feb. 3 after Dominic Green’s 3-pointer at the buzzer sealed the 78-75 win over Arizona. That was fun. Now comes the rest of the season, which continues Saturday at Oregon State. Regardless of the outcome the next few weeks, Hopkins is thrilled with where he is. What if Boeheim ever retires and Syracuse calls? Published: Feb. 10, 2018, 9:47 a.m.